The sky overhead is one of the most beautiful and dynamic things we see in our life, yet most people pay little attention to it. Even the most picturesque stuff like rainbows, sunsets and thunderstorms, which is shown to us regularly and free of charge, does not get much attention. Sunset at Wheeler Peak, New Mexico. Kuril Islands, Russia The famous Green Flash is not as rare as generally believed. 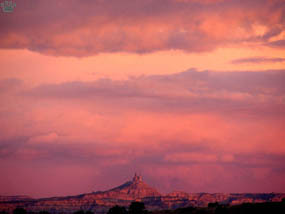 If you often watch sunsets at a seashore, sooner or later you'll see it, especially if you watch from seaside mountains. California and Hawaii are both good places to look for Green Flash or for Novaya Zemlya effect, when you can see the sun for few seconds after the actual sunset. Sunset near Davidson Seamount, off California. 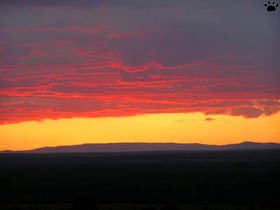 The main difficulty in observing Green Flash is that it is very brief. Only one of the above pictures shows it clearly, although they were taken with 1-minute intervals. The Pacific Rim is probably the best place to watch sunsets. This one was really a good luck, because there are only 20-30 sunny days per year at Commander Islands. These islands are so well hidden in sea fog, that even the Aleuts had not found them until Bering's expedition discovered them occasionally in the 18th century. Haleakala, Hawaii Summits of Hawaiian volcanoes provide a good opportunity to watch bright-colored sunsets while staying above the clouds. Although there is some very unusual flora and fauna on these mountain tops, they look so desolated that it feels like watching the sunset from outer space. As Hawaii are far from any continent, there is almost no dust in the air, and astronomic visibility is unique - no wonder the famous observatory was built on Mauna Kea. But tropical sunsets are very brief - you have to visit high latitudes to get an opportunity to enjoy sunsets for hours (or, if you get very close to a pole, for days). Beyond the Arctic Circle, summer "nights" are the most beautiful time. Sunset-like colors set the sky aflame, everything is quiet, and mosquitos are mostly sleepy. On Arctic islands, there are no sunsets at summer, but August to October is practically one long sunset. Khanka Lake, Ussuriland, Russia Even during the monsoon season, when it can rain for weeks, a change from rain to a thunderstorm can result in beautiful sunset. Traveling in China or Russian Far East, you are sometimes awarded by such a sight after many days of awful weather. 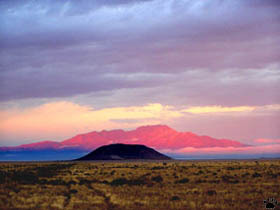 Morning at Sevilleta National Wildlife Refuge , New Mexico. 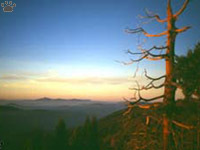 Deserts normally have clear, but dull sunsets and sunrises. This one (right) was the only exception in more than six months I have spent in the deserts of the Middle East. I watched in from a yacht in the Gulf of Akaba. 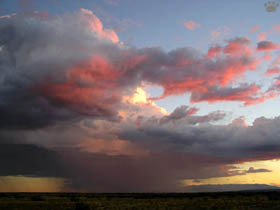 Monsoon season sunset at Sevilleta National Wildlife Refuge , New Mexico. 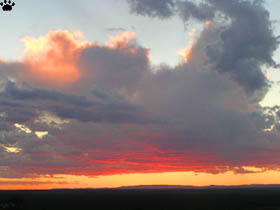 Spring sunset, Tucson, USA Only when rain clouds make it to the deserts, they bring bright colors to the desert sky. 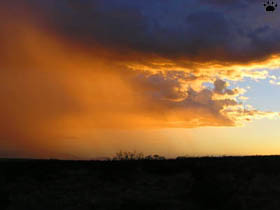 Spring and summer sunsets can be very beautiful in Sonora and other North American deserts. 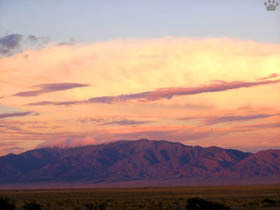 Sunsets in Chihuahua (left) and Great Basin Deserts, USA. In high mountains of Yunnan and Sichuan, monsoon rains often fall nonstop for up to five months every year. As rivers flood narrow canyons, the secondary evaporation from mountain slopes forms spectacular clouds which gave one area in Yunnan its name Yunlong - "The country of dragons in the clouds"
View from Kokee Plateau, Kauai. Alakai Swamp, Kauai. The wettest place on Earth, however, is not in Asia or South America, but in the mountains of Kauai - one of Hawaiian Islands. Summer monsoon, Pamir, Tajikistan Some summers, the Indian monsoon gets to Pamir, bringing rain and snow to the high desert. 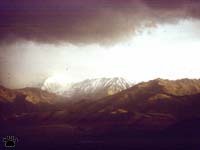 Most years, storms are rare in summer on Pamir Plateau, but they are always spectacular. This thunderstorm flooded our camp, although it was on a slope, not on a valley floor. 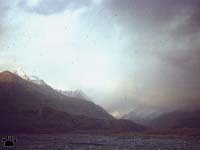 Even when the monsoon spills to Pamir over Hindukush once in a few years, it only reaches its southeastern and southwestern corners. You have to go to the Eastern Himalayas, to Bhutan or Northeastern India, to see the full splendor of the monsoon, when up to 15 m (50') of rain may fall in one month. Central Square, Cuzco, Peru Cuzco, the most beautiful city in the Americas, owes much of its beauty to its weather: the ancient capital of Inca Empire is one of the highest cities in the world. 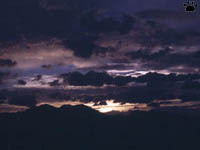 During a day, the weather can change many times, and the light is so interesting that Cuzco is a photographer's paradise. Parts of the Andes are so dry that no clouds form above them for years. 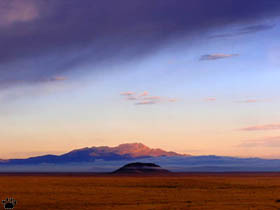 In such areas, you can see typical "desert-style" sunsets at 6000 meters (20,000 feet) above the sea level. Some of these valleys are the driest places on Earth - it has never been raining here since at least the 15th century. Some Chilean mountains are the only places on our planet with no water erosion. Lack of surface runoff made possible the preservation of ancient landforms and famous Nazca Lines. Sunset, Lauca National Park, Chile Nazca Plateau, Peru. Manu National Park, Peru. Not far from these "absolute deserts", you can see cloud forests where it rains daily for centuries. In some canyons, the afternoon air is so filled with moisture that you can sometimes provoke the rain by shouting loud, or by firing a gun. But these rains are never as intense as monsoon rains of Asia. Only in the outer parts of Great Neotropic Rainforest, you can see well-developed monsoon season with its violent thunderstorms and hurricanes. 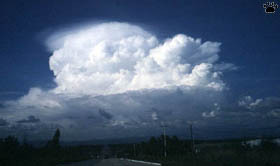 During the rainy months, tornadoes can be occasionally seen in La Plata, Orinoco and Magdalena river basins. 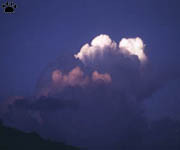 Monsoon clouds, Nevado Del Ruis, Colombia. Developing F1 tornado, near Medellin, Colombia. Torres del Paine, Chile Further south the weather is often violent. Hurricane-force winds blow through Patagonian mountain valleys during spring months. 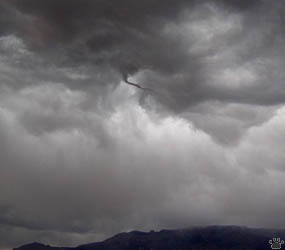 These winds form umbrella clouds above mountain tops. The stronger the wind, the more stable are the clouds of this type. It was hard to believe my eyes when I watched them remain motionless above summits, while the wind was strong enough to carry egg-size pebbles and dead sheep. The winds have great impact on local flora and fauna. Lost Coast, California These storms severely damaged some ecosystems in tidal zone, and killed hundreds of pups in some colonies of elephant and harbor seals. In normal years, storms are seldom so severe in California, but even worse on the eastern coast of Kamchatka and the Kuril Islands, especially in the Museum of Natural Disasters area. Kageti, Georgia The heaviest snowfall in modern history occurred in 1987 on both slopes of Western Caucasus. In some valleys, more than 33 meters (100') of snow packed the forest up to treetops. The Nordmann firs on this picture are in fact 70 m (230') tall. Mega-avalanches destroyed hundreds of villages, including some Svanetian towers more than thousand years old. I took part in a mountaineering expedition that winter, but we could hardly move in bottomless ocean of snow, and soon joined a rescue team to help evacuate Georgian villagers. In normal years, there is no more than 24 m (80') of snow in the mountains of Caucasus. Supercell storm, Florrissant, Colorado The Tornado Alley has the most spectacular thunderstorms in the world. The best time to see them is usually early May to late June. These storms get particularly violent when a cold front from the Rocky Mountains rolls east across the prairie and rams into the moist air that spreads north from the Gulf of Mexico. 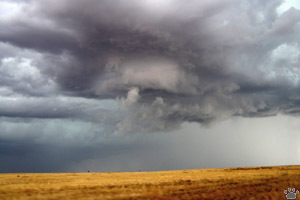 Cumulus cloud, Wind Cave, S. Dakota. 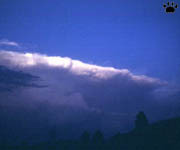 Anvil cloud, Wind Cave, S. Dakota. Supercell thunderstorm near Calgary, Canada. Thousands of people come to the Alley every spring for tornado chasing. I've been there during May season twice, with no luck. 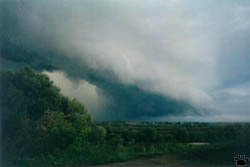 But I did see a rare winter tornado in California's Central Valley, and a splendid supercell thunderstorm in Alberta, at the northern edge of the Alley, in July 99. 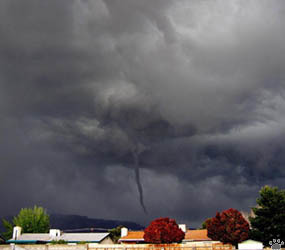 Funnel cloud over Albuquerque, New Mexico. 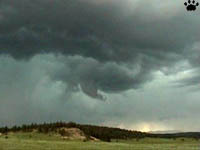 Storms usually start in southeastern parts of the Alley in March, then gradually shift west and north, reaching Canada and Rocky Mountains foothills by June. 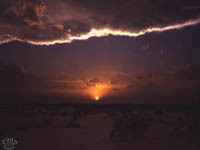 Stormy sunset, White Sands, New Mexico. 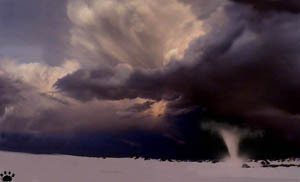 Tornado, White Sands Nat'l Monument. If you are an inexperienced tornado chaser, it is always better to use a rental car. The risk of being hit by a tornado is minimal, but large hail is always a possibility. It is often difficult to see before it starts falling on you; the hailstones can be as big as apricots, and sometimes as big as small melons. 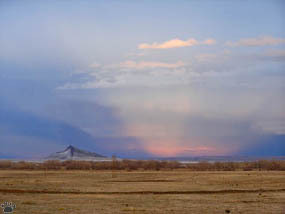 Crepuscular rays, near Pueblo, Colorado. 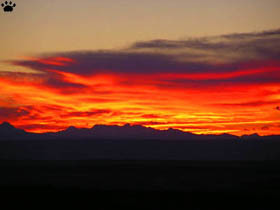 Sunset, Bisti - De-Na-Zin Wilderness, New Mexico. 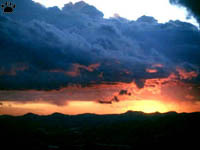 Sunset on Mount Evans, Colorado. Windy night at Mount Evans. If tornado chasing sounds too risky for you, try watching these storms from the safety of Mount Evans in Colorado - it overlooks the Plains. Mt. Evans is also a good place to see rare types of electric discharges known as red elves. 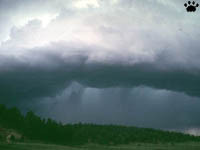 Unlike lightning, they occur above the clouds, not below them. 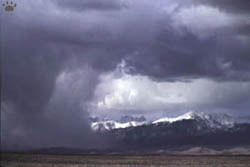 Snowstorm moving along Sangre de Cristo Mountains, Colorado. 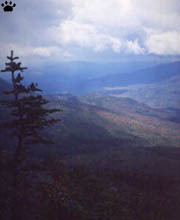 View from Mount Washington. Another North American mountain famous for interesting weather is Mt. Washington in New Hempshire. 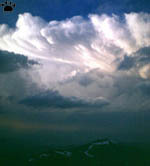 The strongest winds ever recorded were measured at its summit. Cloudy day at Mt. Washington. Northeastern North America is not only a region with particularly unpleasant weather. It is also the most accessible place to see Northern lights - thanks to the proximity of the Magnetic Pole, they can regularly be seen further south here than in Alaska, Northern Europe, or Siberia. Cirrus clouds over Labrador Peninsula. Great Slave Lake, NWT. 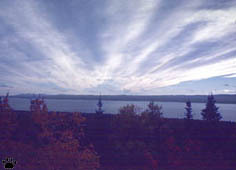 The area south from Great Slave Lake is good for Northern lights, and, in summer, for high-altitude clouds. They consist of hydrogen peroxide or, according to another theory, of sulfuric acid, and can sometimes be seen in the sky all night long (that is, 3-4 hours). Californian weather seems dull in summer, but winter and spring are sometimes violent and unpredictable. 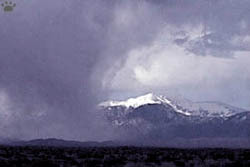 This snowstorm was associated with the strongest one of many unusually deep cold fronts in "La Ninya" year of 1999. Below 1500 m it was a rainstorm with some hail. Driving to the summit in our tiny Toyota, we just missed a chance to become the first avalanche victims in the history of San Francisco Bay Area! Cone Peak, California. 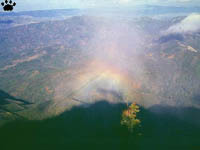 Cone Peak in Santa Lucia Mountains is one of the best places in the world to look for interesting things in the sky: fog and storm clouds, green flash and Broken effect, beautiful sunrises and sunsets, weird halos and winter rainbows. Even with no storms around, the Pacific Rim is still the area with the most beautiful weather on Earth. Ocean currents bring layers of fog to the shores of Asia and America, cold waves from Siberia and Arctic Canada flood intermontane valleys, dry hot air from Mongolia and Mojave rushes to the coasts each summer - every day you can see something new in the sky. Supercell thunderstorm, Zombitsi National Park, Madagascar.